As of 2011, Lakeside (zip 85929) full time population is around 8,000 people. Since the year 2000, that is a population growth of 30%. The number of people at lease double during summer with the part time or seasonal residents. Lakeside ranges in elevation around 7000 feet and is nested in the popular area of the White Mountains. Average low to high tempuratures are 20 to 47 in January and 57 to 87 in July and gets about 21 inches of rain per year and about 65″ (5+ feet) of Snowfall. Lakeside is part of the Blue Ridge Unified School District. The Varsity Soccer Team is currently on an unbelievable 37-0 winning streak and has won state championships the past two year. They also receiving the Old Pueblo Sportsmanship award last year (2010). In 2008 the Girls Track Team were the State Champions. Founded in the early 1880’s by Mormon pioneers, Lakeside derived its name from the area’s lakes. The first establishment was a store run by Billy Scorse, an Englishman in the 1890s. Billy Scorse owned 40 acres along a creek and Billy Creek was named after him. The 1890’s saw the development of orchards and farms in the area. Rainbow Lake was developed just after the turn of the century out of necessity. Sheep herders and cattleman began their grazing of the White Mountain area in the 1880s and the were driven out of business by the turn of the century because the 1903-04 winter drought was too dry and the blizzard that followed the next winter was too wet. Soon after Niels Hansen decided to build a dam and constructed irrigation ditches that are still in use today. It is said that in the year 1906 six men sat inside of Niels Hansen’s barn that was near the recently finished Rainbow Lake and decided on naming the town Lakeside. The sheep herders stayed around until the 1920’s. The old Lumber Mill in Mc Nary first built in 1916 aided to the development of the White Mountains. Southwest Industries purchased the mill sometime in the 40’s but in 1979 there was a huge fire at the mill and it was closed for good. To log the White Mountains they built a series of railways throughout the mountains. The logs were cut loaded on rail cars and then transported to the lake in McNary. Then they were milled and railed to where ever they needed to go. Lakeside and neighboring town Pinetop incorporated as one town in 1984. 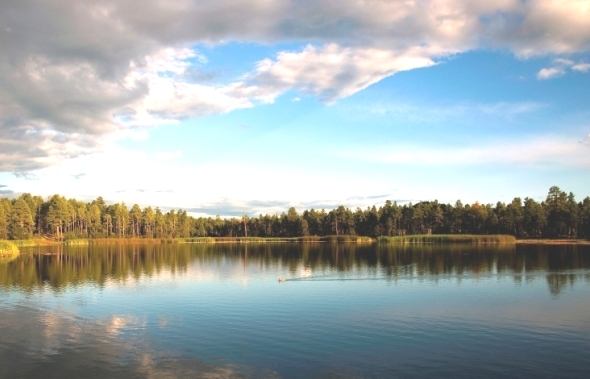 Pinetop-Lakeside is at an elevation around 7,000 feet. Many of the residents who were born and raised in either town or have lived here several years still refer to the separate communities. To this day there is a Pinetop Post Office, a Lakeside Post Office, the Pinetop Fire Station and the Lakeside Fire Station.